My family and I just spent a year on the water. When we left, some members of our crew were hesitant about the whole idea, so I knew we needed as many comforts of home as possible. High on that list was an always-on (almost), always-available (almost) internet connection. It turns out this isn’t a simple or one-size-fits-all issue. It’s also something I’m most frequently asked about. 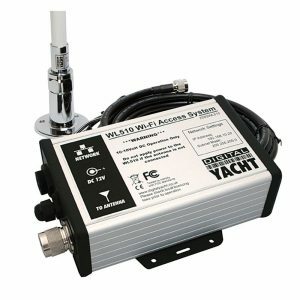 What follows is a primer on marine internet and the start of an article series about the myriad tech options to keep your boat connected. WiFi — Land-based WiFi works well if you’re in a marina with a well-constructed WiFi network, behind your house with access to your home WiFi, or in a location with a publicly accessible hotspot. Various WiFi bridges can extend the range significantly but are very unlikely to make WiFi connectivity effective while underway. 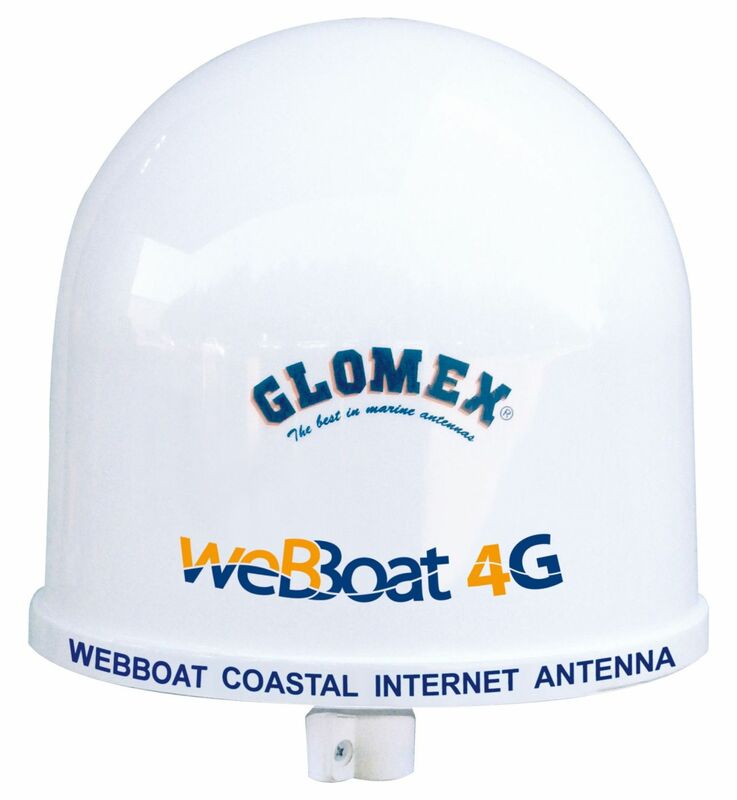 Cellular — Internet via cell most likely means using your phone as a hotspot, or using a dedicated hotspot — either marine-based like a Glomex WebBoat or WiriePro or one provided by your cellular carrier, like a MiFi. This option usually works well until you’re about five to ten miles offshore, where the signal will dwindle and you’ll be without connectivity. Satellite — Satellite communications systems can connect to the internet almost anywhere you can take your boat, but the vast and seamless coverage can easily cost orders of magnitude more than the other options. Satellite is also likely to offer both the lowest throughput and highest latency. Before detailing the options and my own experience, here are some important basics about online connectivity. Internet speed — also known as bandwidth — is measured in megaBITs per second (Mbps) while file sizes are measured in megaBYTEs. There are 8 bits in a byte, so, if a file is one megabyte and you have a 1 megabit internet connection it would take 8 seconds to download that file. A 10 Mbps connection would take .8 seconds to download the same file. Megabits and megabytes are very frequently mixed up and that leads to confusion about the actual speed of data transfer. Let’s throw another number into the mix for throughput and data transfer. Most cellular offerings are sold based upon the number of gigaBYTEs transferred. If you use a lot, even unlimited plans are usually subject to throttling (or in cell company speak “traffic management”). Data transfer is a count of the total amount of data you’ve transferred in a month. This means the faster the connection, the faster you can use up your data allotment. 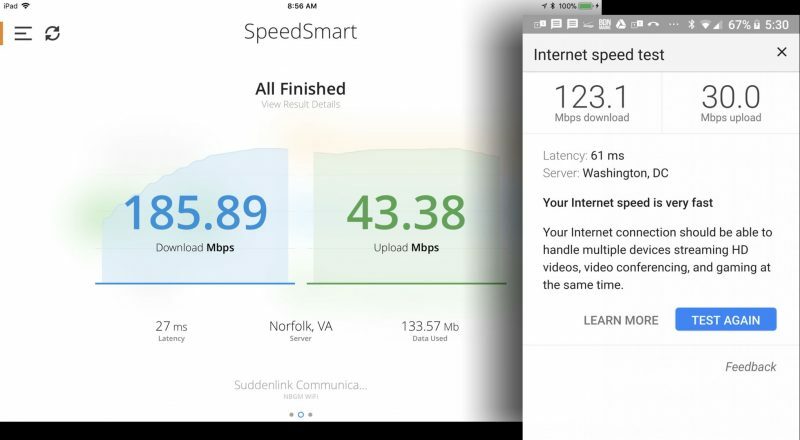 Meanwhile, WiFi and home internet services like DSL or cable are usually measured in terms of throughput speed, in megaBITs per second. For some sense of comparison, 1 gigaBYTE = 8,000 megaBITs, and one hour of HD television streamed at 8 megaBITs per second is about 3.6 gigaBYTEs of data transferred. 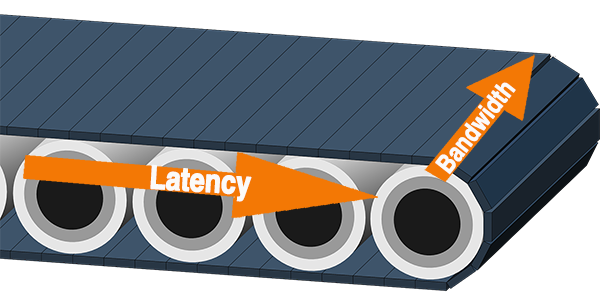 A second important aspect to connectivity performance is latency. Latency, also known as ping, is the measure of how long it takes a packet of data to get from your computer to the destination and come back, so smaller numbers are better. Your home internet connection usually has latency between 10 ms and 40 ms, whereas, a good LTE connection will have 40-80 ms of latency. Satellite typically has latency in excess of 600 ms with real-world latency pushing over 1,000 ms (that’s a full second). The image above tries to illustrate the impact of both bandwidth and latency. Bandwidth is how much data can be delivered at once. Latency is how long it takes for that delivery to get there. Another visual metaphor for the difference between bandwidth and latency is vehicles on a highway. A bus is a high bandwidth vehicle because it can carry a lot of passengers while a sports car is low bandwidth since it can only carry two people. A car or bus traveling at 10mph have the same high latency because they will take a long time to get from starting point to destination. If either goes 100mph, that’s pretty low latency. For some services latency isn’t a big deal. If you’re watching streaming television, latency is pretty much irrelevant once the program has buffered (locally storing data that you’ll soon need). For voice-over-IP (VOIP) or any kind of remote-desktop applications, latency is very important. VOIP typically degrades to a point where the conversation is difficult to sustain around 150 ms of latency, while remote-desktop applications tend to behave poorly above 300 ms of latency. Web browsing can be impacted by both throughput and latency. Every element on a page — text, images, videos, sounds, style sheets and scripts — is typically downloaded separately. Each of those elements will require multiple round trips as your computer makes requests and they are served. The time those roundtrips take is determined by latency while the number of trips required to load all the data is determined by bandwidth. 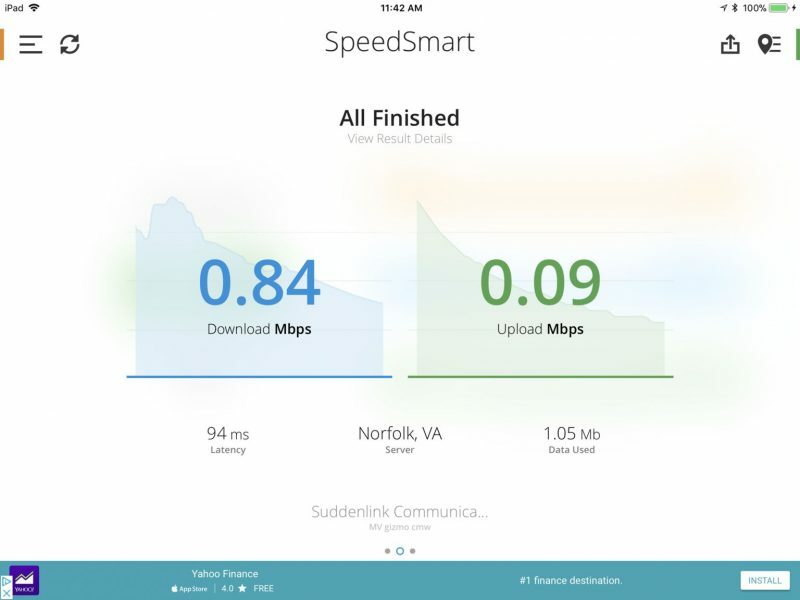 This litany of numbers is part of why your neighbor might say they’ve been experiencing great internet at the marina for a while, but you tried it last night and couldn’t even stream three minutes of Stranger Things. Not many years ago, an internet connection was a nice to have on board and relatively unheard of while underway. 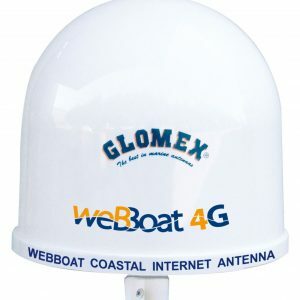 But the number of people living aboard full time and working from their boats is increasing quickly, and many part-time boaters now consider reliable internet connectivity a must-have. Fortunately, the technology is getting better and the options are increasing at the same time expectations are rising. LTE cellular, for instance, is capable of delivering 10-20 Mbps of bandwidth with a latency of 40-50 ms, and that’s as good as most of us had at home not long ago. My family and I recently spent 14 months on our boat cruising the Great Loop. We visited 97 different marinas and used their WiFi about two-thirds of the time. While we’d long complained about our home marina WiFi in Chicago, traveling taught us that our marina wasn’t unusual and also that there are few ways to predict the WiFi quality. Lovely marinas with beautiful facilities, excellent infrastructure, and great staff had some of the worst WiFi we saw. Several tiny marinas in the middle of nowhere with docks in danger of collapsing into the water delivered flawless connectivity. 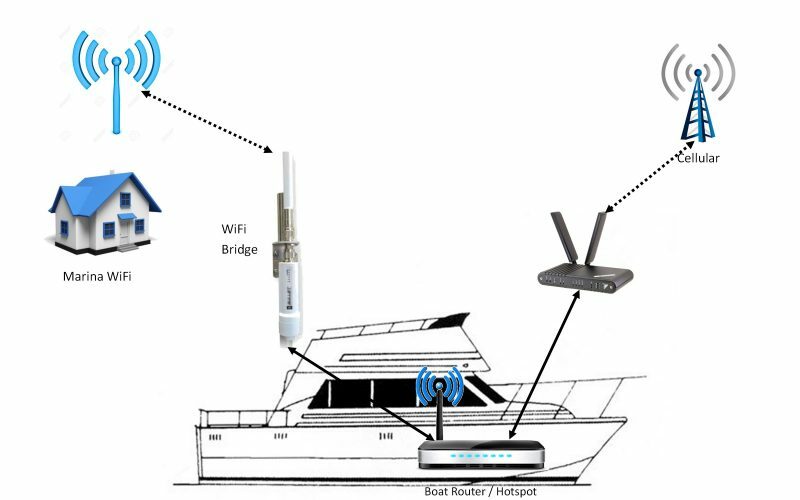 We did notice that marinas who contracted with onSpotWiFi offered well designed, reliable and high-speed connectivity. Steve Mitchell does an excellent job explaining the many factors marinas face when building their WiFi networks in his article Marina WiFi is hard on his blog Sailbits. The long and the short of it is that marina WiFi is a difficult thing to deliver well and many marinas simply don’t do a good job. Sometimes that’s due to circumstances beyond their control and sometimes because they simply don’t pay any attention to it. Steve also points out the balance between what marinas can do to improve their WiFi network and what boaters can do to improve their ability to receive WiFi, and I’ll spend most of my time on the latter part of that equation. During our time traveling, we relied on a wireless cellular hotspot with an unlimited data allotment. With a mix of my children’s YouTube habit, my wife and I watching TV, surfing the internet and other incidental uses we used between 250gb and 350gb (that’s gigaBYTES) of data per month. Of the over 400 nights we were gone, we had just two in the U.S. and Canada without service. During about six weeks in the Bahamas, we used a mix of Bahamas WiMax, a network of high powered WiFi hotspots and BTC, the Bahamian cellular carrier. Typically our hotspot got about 10 Mbps of download throughput, which was enough for us to go about our normal activities online without much thought to how we connected. We had enough cellular bandwidth that if a marina had poor WiFi connectivity we simply switched back to our hotspot. The system currently installed on my boat may sound complex, heck it is kind of complex. I built it for me and my uses, ease of use wasn’t a big consideration. Any time there’s a problem with internet connectivity my wife comes and finds me. There’s a lot of new, designed for marine use, product on the market since I built my system. I’m going to be testing a lot of those products and hope that I’ll be able to find easier to use products that still deliver the range of capabilities I have now. Before we left I spent some time getting the boat’s network ready for our travels. 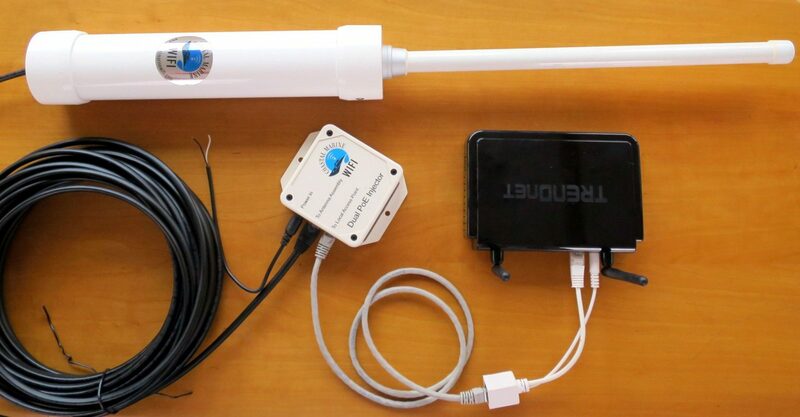 The heart of our boat network is a Ubiquiti EdgeRouter, a remarkably capable device for $75. The router allows for multiple internet connections, powers passive power over Ethernet (POE) devices like Ubiquiti WiFi Bullets, offers a robust user interface and supports enterprise-grade features like VLANs, QOS, dynamic routing, and VPNs. On our boat the EdgeRouter tests two incoming internet connections and decides which to use based upon those tests. That means we can be in a marina, connected to marine WiFi, when we pull out the EdgeRouter will see the WiFi connection stop working and send all traffic to our 4g connection. Branching out from the EdgeRouter I use an Engenius EAP1200 access point to provide WiFi connectivity to devices in the boat. One potential downside to Ubiquiti’s products is that all that power and features at a low price do come with a more complex user interface. It’s not the easiest device to configure and, in fact, if you start with the devices in their default state and plug them in they won’t pass any traffic. Peplink enjoys a good reputation for high-quality hardware, good features and an easy to use user interface. Unfortunately, Peplink’s blend of features and ease-of-use also comes with a higher price tag, starting at 3x the cost of Ubiquiti’s products. 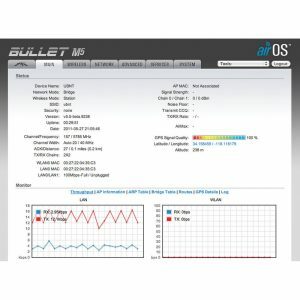 I use an older Wave WiFi Rogue Wave wifi bridge — with a Ubiquiti Bullet inside — to connect to 2.4ghz marina WiFi networks, and for 5ghz marina networks I use a Ubiquiti Bullet Bm5-Ti. LTE connectivity is provided by a Netgear LB1120 LTE modem connected via ethernet to the EdgeRouter. This setup allows the WiFi bridges to be the preferred connectivity, and if no connectivity is provided by the bridges then the LTE modem provides the connection. The devices in the boat simply connect to the boat’s internal network and aren’t aware of how the boat is connected to the internet. This stood the test of 14 months of use and proved highly reliable. Our LTE internet service was provided by a company called 4G Antenna Solutions (4GAS), which started out providing cellular internet connectivity to rural areas. 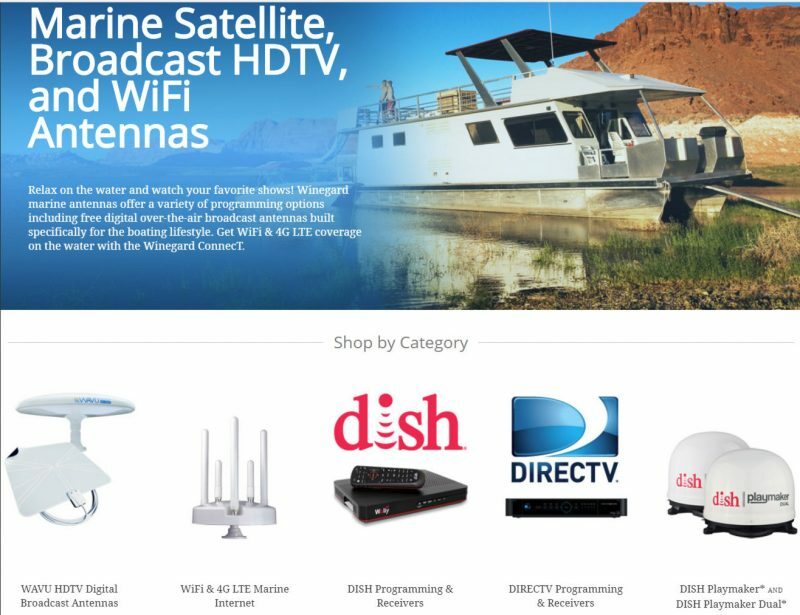 Equally desirable to boats and RVs, I found this service offering at RV Mobile Internet, a resource that tracks the best connection options. The cellular carriers frequently change their offerings and the rules of their plans, so an option that worked a couple of months may not be viable any longer. Fortunately, the offering from 4GAS has worked well for over a year. Nearly all of the unlimited cellular offerings come with a threshold at which point the carriers warn you they may throttle or rate shape your traffic, and while 4GAS has changed the cap a couple of times, I’ve nearly never seen any throttling. Prior to our trip I had some grand visions of the kinds of remote places we might be and the potential need for satellite internet connectivity, further research ultimately change my mind. 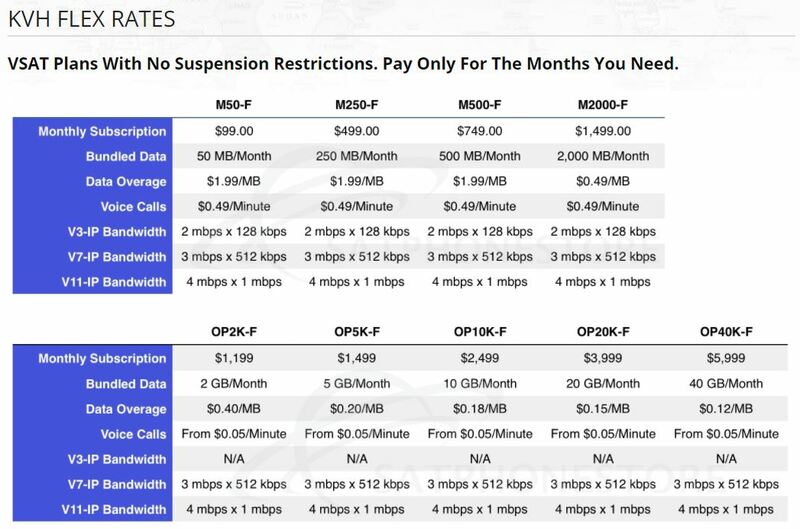 Satellite internet of similar bandwidth to cellular offerings is orders of magnitude more expensive. 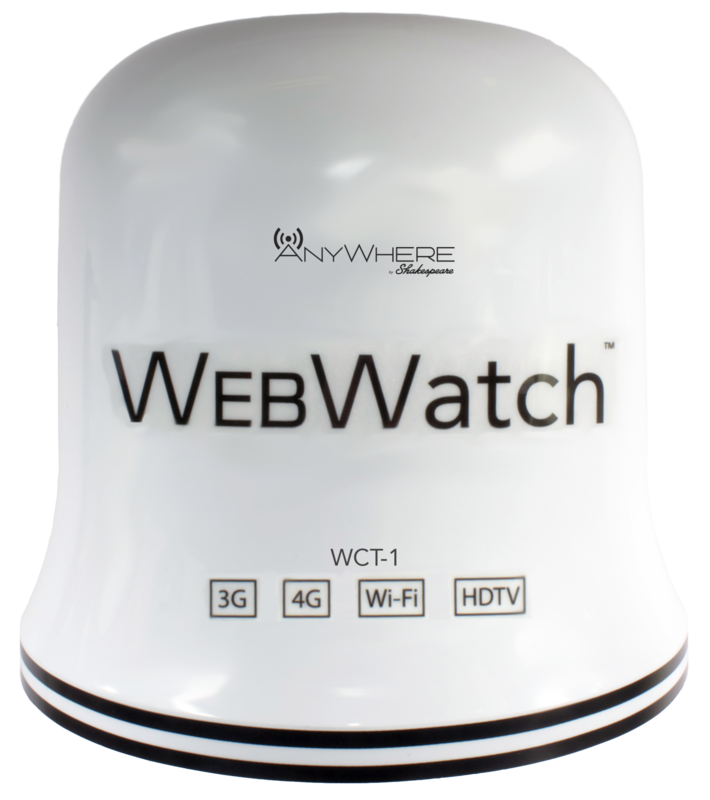 In looking at the options I found more affordable options out there for much lower bandwidth satellite connections suitable for email and occasional web browsing. Considering our cruising grounds and likely availability of land based options I decided not to pursue satellite. As we consider more travel to different places that may change. I watch satellite announcements carefully hoping we will see advances that bring the price point down. Many of the people we traveled with had very little networking equipment on board. They relied on marina WiFi internet and used their cell phones or cellular-enabled tablets when away from the marina. Depending on your expectations and use of the internet, this might be a fine solution for you. But I suspect that many readers are boaters like me who desire robust connectivity underway and are reluctant to rely on the variable quality of marina WiFi. This spring and summer I’ll be testing a number of different internet connectivity options, assuming the weather in Chicago ever warms up. Many of the more recent products introduced to the market are trying to simplify the litany of stuff I described above. Instead of separate devices for WiFi and 4G we are seeing lots of products with everything built into one unit. I’ll be testing a couple of those as well as the most recent products from some of the familiar names in onboard connectivity. When further afield we often have to live with flakey Internet access.  Can you suggest a browser that will download ONLY the text from web sites? Reader view in Safari is a help. The Opera browser will do exactly that. Just a checkbox in settings to disable images. And there’s an add-on to disable images on a site-by-site basis. Great article, looking forward to more. One option I’m keeping an eye on is SpaceX low Earth orbit satellites internet service. The prototypes are up and testing, rollout if memory serves starts 2019. BenS, I’m looking forward to your upcoming articles on boat WiFi – cellular connectivity. I appreciate the basic tutorial defining this technology, but honestly, I approach a subject like this looking for a single box, an App, connect power and your up and running, type of system. It seems this might be the direction the hardware is heading. My current WiFi extender is usually non- functional so I’m definitely interested in a better low current draw solution, at least in port. Articles on internet connectivity are always interesting and show how many people are looking for solutions. But I find most of the articles, like yours, focus on U.S. use. We travel to Mexico and Canada every year or two, and are constantly looking for a way to connect there, as well as in the U.S. The problem with buying a data sim from a local provider is a) it can get very expensive, and b) many providers require buying a year plan even if we are only there 4-6 months. If you have any ideas for multi-country use (i.e. a world-wide universal router) I would appreciate the info. Google’s Project Fi is simply excellent for travelling internations. 4G Data is $10 a gigabyte, no matter where you are in the world (including the U.S). Data only SIMS are free — you pay only for the data. If you don’t want to buy one of their phones, it is possible to activate a SIM on a friend’s phone and then put it any phone, even an iPhone. In the U.S., you will be on T-Mobile. Internationally you will roam to all sorts of carriers. I can’t say about Mexico, but in Western Canada it works like a charm. 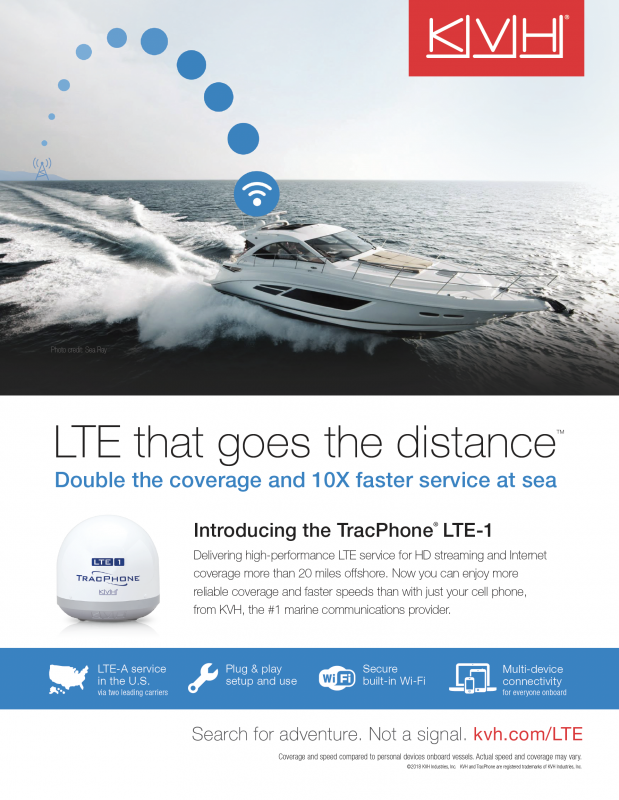 The EAP1200 does provide in-boat client network WiFi. It’s not necessary to use separate wireless access points but for management, upgradability and reliability it’s a configuration I far prefer. If I want to change the router I can do so without impacting wireless and vice versa for the access point. 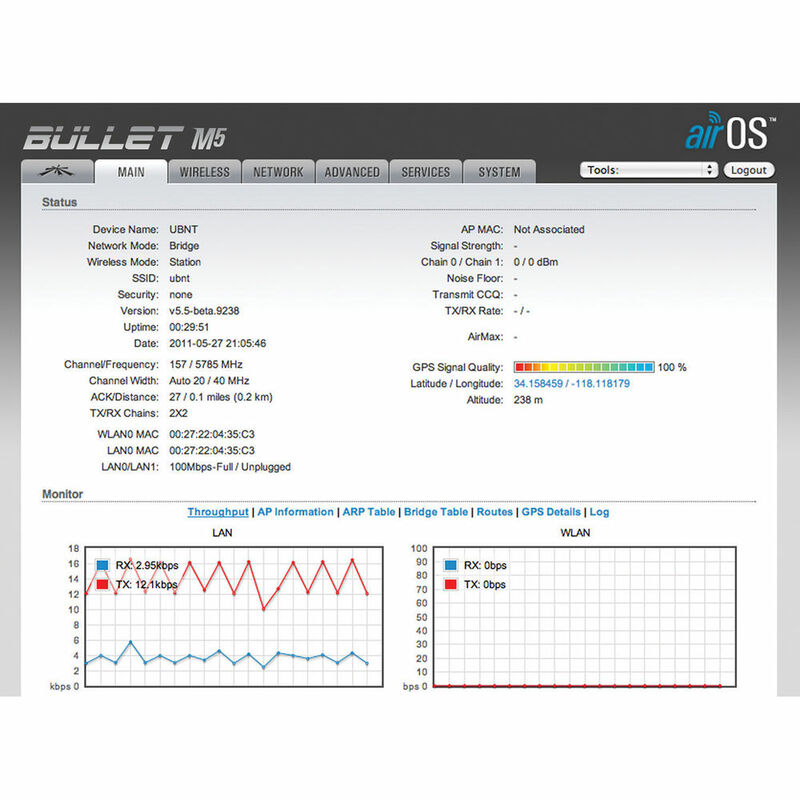 I do run two bullets on the arch, they are both powered by the EdgeRouter as is the EAP1200. 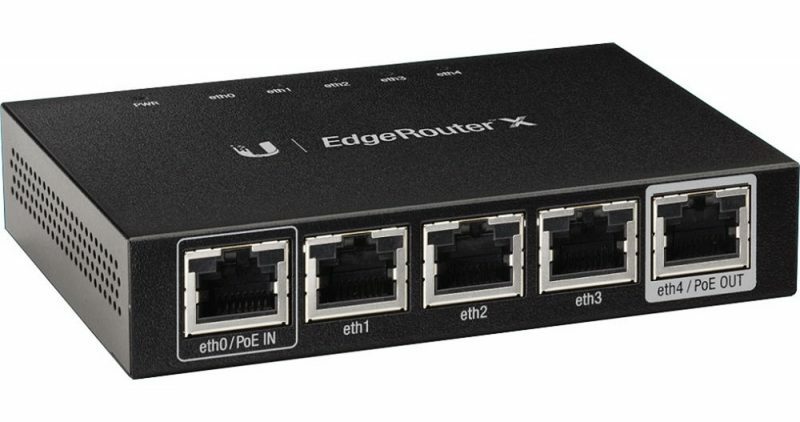 My model of EdgeRouter has POE on all five of it’s ethernet interfaces. The product photo shown in the article is for a slightly different model. I power my EdgeRouter via 12v and it in turn powers everything else. 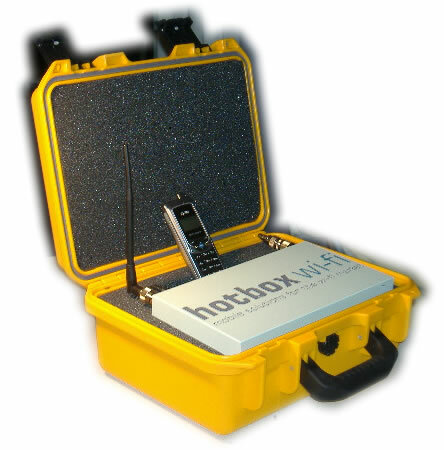 Could you please also consider testing MVGs NeptuLink and Locomarine’s Yacht Router solutions and compare them against e.g. BoatWeb? For a future article, perhaps you would consider testing my set-up. I am using a MikroTik wifi/poe router (hAP ac lite) and the Groove 52ac for marina wifi. These two components are very inexpensive. I’m interested in how you would interface LTE into that set-up at a reasonable price. Would that NetGear LTE modem do the trick? This is very much a roll-your-own solution. Configuration is complex. Someone should write a simple iPhone software interface to the router OS for this use. I’d buy one for sure! I don’t have any hands on experience with the MikroTik hAP line but as long as it supports WAN (internet connection) balancing or selection an ethernet based LTE modem like the NetGear I’m using would allow you to add an LTE connection to your setup. Part of the premium you pay for a dedicated marine product is for the ease-of-use and configuration apps. Ubiquiti has a very nice management app for their AirOS products but it’s aimed at managing more complex networks not at simplifying small networks like we run on our boats. My reasonable LTE setup was the same Netgear LB1120 which Ben talked about – its a great modem as long as you’re not traveling internationally. …is interesting in part because it suggests how hard cell data can be when going international. 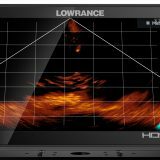 I believe that there are similar devices out there that aren’t so marinized (and expensive) and wonder if anyone has had experience? Ben, I have the Pepwave SOHO router, Ubiquiti wifi and Netgear 815s cell modem. I also have the ubiquiti PoE switch. Cost aside, do you prefer the ubiquiti EdgeRouter or the Pepwave SOHO router? Cost aside I think they’re both great products but I have to give an edge to Pepwave product for a better user interface. Also, if you have any questions on this I would suggest you might post over in the new Marine Electronics Forum. 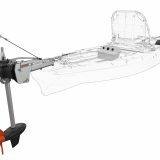 We’ve teamed up with Steve Mitchell from SailBits on the forums. Steve is a longtime PepWave user and quite knowledgeable about their products. 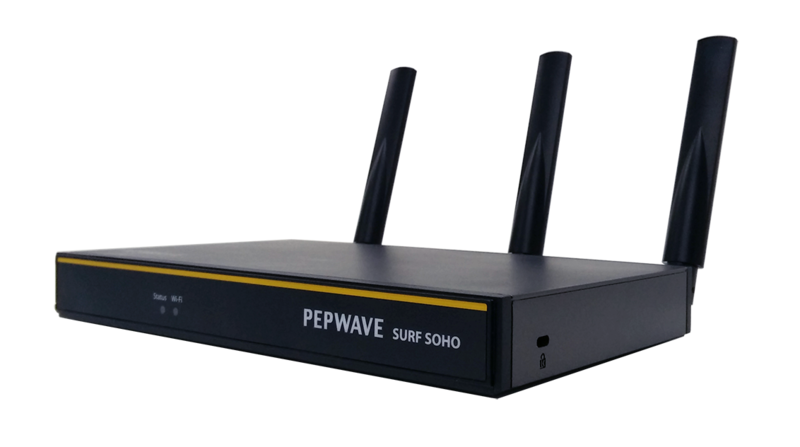 As Ben mentioned, I am a longtime user of Pepwave, but also Ubiquiti/UniFi products. I use both in commercial installations for my “day job” as well as consulting for marinas and boaters for my side job(s). If I were setting up a WiFi network across a building, home, or marina, I would choose Ubiquiti/UniFi for the actual access points, switches, and management. I would use Pepwave for the router between that business/place and the Internet. 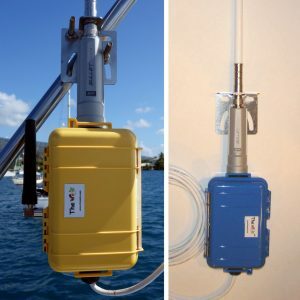 If I were building out a boat network, I would choose Pepwave across the board if I could afford it, as they make compact single box solutions that have more features than anyone else on the market. Ubiquiti/UniFi’s routers are amazing when it comes to performance, but their UI and features are a long ways behind the general market. Hey Ben, been reading the manual of the Ubiquity EdgeRouter. What technique did you use to decide whether to route traffic via the bullet (wifi) or the 4G modem? For the most part I let the router decide. It is configured with a service that monitors connectivity on both links and decides if each connection is up and passing traffic. If it is it then load balances across the two connections. If for any reason I didn’t want traffic to go to one connection or the other I went into the EdgeMax UI and disabled the connection I didn’t want to pass traffic. 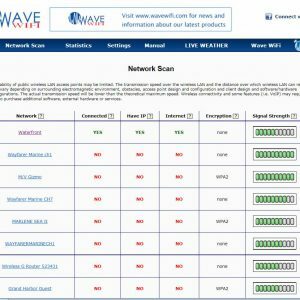 Hi Ben, one additional question, does the Ubiquiti Bullet Bm5-Ti provide a simple UI, like the Wave WiFi Rogue Wave so select the best SSID to connect to ? 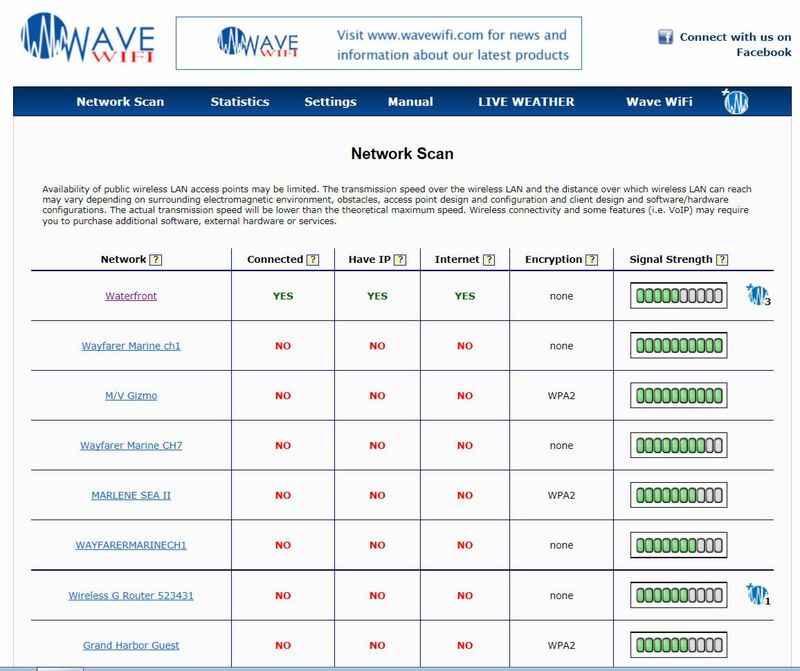 The native Ubiquiti UI isn’t nearly as simple as the Wave WiFi UI. You can see it above (it’s the middle picture just to the right of the picture of bullet and to the left of the Wave WiFi UI). It is a very powerful UI and allows control and diagnostic information on every aspect of the bullet but user friendliness isn’t its strong-suit. Ben S. – Have you had a chance to test the Ubituiti Bullet AC yet? It’s the kind of dual-band option I’m looking for, to replace my Bullet-based 2.4Ghz “Badboy Extreme”. 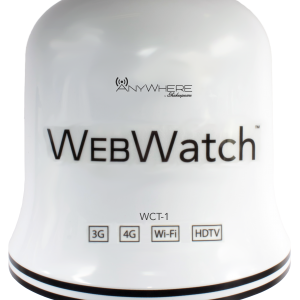 It’s also very affordable – but I’ve read that it is hobbled by some proprietary TDMA-based “airMAX” software, that cannot be disabled – and ONLY allows it to connect to hotspots that are also using Ubituiti Wi-Fi gear with the same software enabled! This makes it pretty much useless for visiting multiple different marinas, if that’s in fact true. I can’t seem to find a definitive answer. The only other dual-band solution I’ve seen that is a screw-on replacement for my original Bullet-based EC is the Rogue Pro – but it’s SIX-times the cost of the Bullet AC, and I don’t really need the “user-friendly” interface, POE injector, etc. – And – I’m curious what device the Rogue Pro is actually using inside – if it’s not the Bullet AC? They advertise that it only requires 12V POE, whereas the Bullet AC needs 24V – so I’m thinking it’s a different device…. I haven’t had a chance to test a Bullet AC yet but I took a look at the specifications on the bullet. It looks to me like the TDMA feature set is an overlay over the standard WiFi standards. I will say I’ve dug for a while now and still can’t find anything that definitively describes compatibility but there’s enough in the specs that makes it appear like it’s an overlay feature. AirMax is the general term Ubiquiti uses for their WiFi product range firmware. the TDMA feature set is (I think, based on my reading) a proprietary mechanism Ubiquiti is using to manage RF congestion. Grant and I also have been chatting offline, and we both contacted Ubiquiti separately. 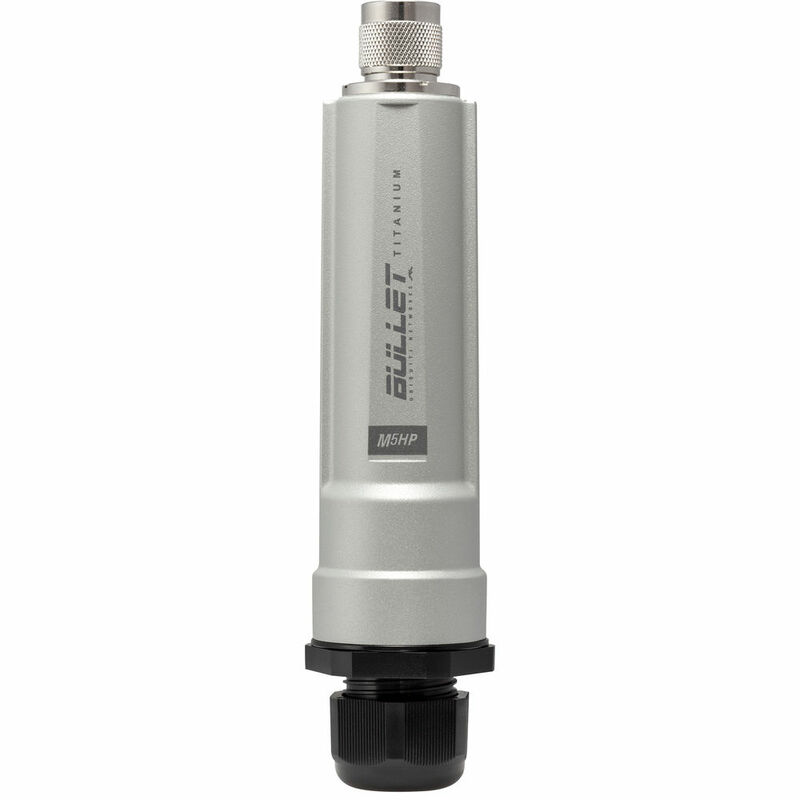 The Bullet AC only works with other Ubiquiti airMAX products, and will not connect to other non-airMAX WiFi endpoints similar to previous Bullet products. Right now the only dual band, cheaper WiFi booster that I know of is the MikroTik Groove series, which I’ve written about a bunch. 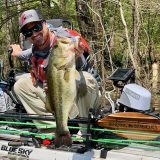 I agree, I just can’t stomach the idea of strapping the Groove to a pole mount on my otherwise nicely arranged radar arch – if I could adapt it to a standard marine mount, it would be a no-brainer. Which brings me back to the Rogue Pro – Rogue started their whole business model, if I’m not mistaken, by taking an off-the-shelf, first-generation Bullet and writing a user-friendly interface for it. So again – if they’re not using the Bullet AC as the “guts” of their dual-band product, what are they using?? And how do I source one of these as a stand-alone product without buying a $600 kit? So at the top of my sailboat mast I have my VHF antenna sidemounted, and on the other side my Groove. A VHF antenna mount will work, as well, but you really need to look at clearance – the Groove body is rather large in diameter. The GAM mount will need a spacer. Thanks Harold – not sure what either of those mounts look like, but this is going on the radar arch of a power boat and uses a standard Marine 1” threaded mount. See the Rogue wave or Bitstorm webpages for an illustration.. The Groove has some kind of twist-off plastic cap on the base which precludes using a threaded mount. I fabricated my own PVC housing similar to what is used by the Island PC Guy. Drill a hole in the top cap and screw the Mikrotik to the antenna. Use an o-ring to seal the antenna to the cap. The base cap must include the female threaded insert and it just screws on to the normal stainless base. Feed the Ethernet cable up through the base and into the housing. Works great. Glad you mentioned this. I did something very similar and it worked out pretty well. The biggest downside is that it’s difficult (really nearly impossible) to see LED indicators on the bullet, though I don’t really have much need for that. 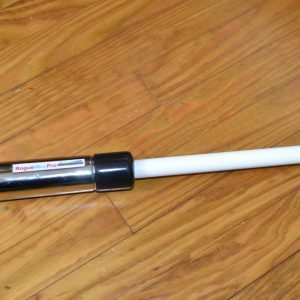 Clear PVC tube helps but is quite pricey and hard to get just 12-16” piece. I’ve been using the Coastal Marine WiFi design — M2 Bullet in an opaque PVC casing — for several years and found I didn’t miss the seeing the LEDs. It’s also held up well and is a cinch to install or mess with since there’s no need to twist the Ethernet cable. Bryan, thanks for the tips. I’ll spend a little time at the hardware store and see if I can duplicate the PVC housing you describe. I need it to be watertight, and also look half-decent. I’m not sure how you get the bottom cap constructed seamlessly to go from 2″ PVC to a female 1-14 straight thread fitting, I’m guessing this involves either multiple pieces or creative machining! 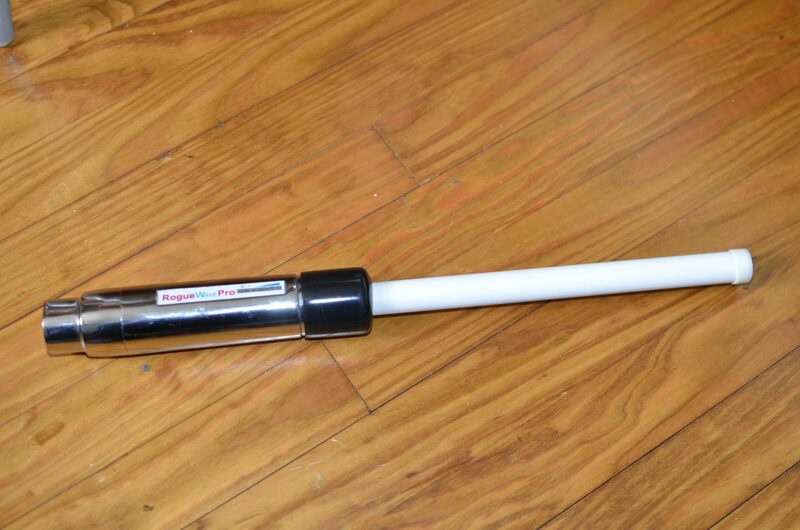 Then we could dispense with the PCV housing altogether and just weather proof the upper antenna connection with heatshrink or what have you…..
You’ll need a reducer to get from the 2″ PVC tube to the 1″ size and then an adapter to insert that is threaded. I found them at the local plumbing store. You can find them online as well. Good luck. I’d like to have one high-power long-range omni-directional dual-band (concurrent 2.4Ghz & 5Ghz for b/g/n connectivity) Wireless Client/EC that’s able to be cleanly mounted directly to a standard 1” marine mount. It’s a shame the Ubiquiti Bullet AC (B-DB-AC) firmware has TDMA connection limitations/problems with non-airMAX access points. It’s got a nice powder coated aluminum body that can be adapted to 1” mounts and sells just under $100 (plus cost of dual band antenna & POE)…please someone make a firmware fix! The only two viable systems I could find are the Wave WiFi Rogue Pro DB (Dual Band) & Aigean LINK7-SS. Both sell for about $625 online which is pretty steep and bound to come down as more competition release similar offerings. It looks like they’re both 500mW Atheros MIPS 74Kc, 600MHz radios so likely based on the Ubiquiti Bullet AC with a custom casing/enclosure and firmware. Anyone test these or know of similar products/solutions? I’ve often heard good things about the company, but I’m pretty sure that users still have to deal with the complex native Ubiquiti or Mikrotik interfaces. I actually have a PDF guide (very rough) of how to setup the MikroTik Groove that I have used with some folks to help them get started. But I agree, a better step-by-step guide is needed. It is definitely on my list of things to do, and I will move it up the priority list based on the interest around it! Hey John, I feel your frustration! 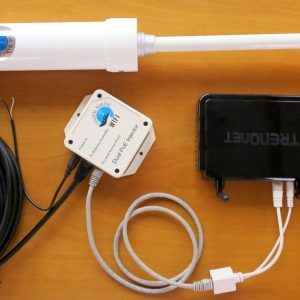 It would have been nice if Ubiquiti hadn’t restricted the Bullet AC to their own airMAX OS networks – perhaps they didn’t realize the installed base of marine/RV users that were already using the various Bullet products for mobile hot spot access – or, just didn’t care to support that market. It would have made an easy swap-out upgrade to any of us already using a single-band Bullet 2.4Ghz version, and finding that band unusable at busy marinas. I did find out, by chance, that the Mikrotik Groove A 52 ac actually fits inside the metal housing on Bitstorms Badboy Extreme MJ (which screws on to a 1″ marine mount), which is the product I currently have. So I’m eager to check that out and see if it fits as promised. Apparently the fellows up in Toronto designed the housing with future expandability in mind, as the Mikrotik product is a slightly larger diameter than the Ubiquiti one, but they claim it will fit. Another general comment, although I suspect this might generate some dissent…. I look at the MikroTik and Ubiquiti products, if purchased directly for the sub-$100 prices, as something I would use for 1-2 years, and then replace with whatever current technology is available. As a result, I am less concerned with longer term marinization (is that a word?) of the devices. I also try not to invest in costly or complex mounting, and use more simplistic pole mounts. I also realize that I live/sail in an area with far less solar damage than the tropics, where even a few months of a plastic MikroTik in the environment will trash it. Nevertheless, for these cheaper products, I try not to get into them for too much money knowing that I will replace them for the same or similar price in a year or two. With standards and technology changing as fast as it does, and knowing the upcoming changes to WiFi and LTE in particular, I don’t think a $500+ investment in WiFi boosting technology is something I could justify personally. Back when LTE was not as prevalent, and 2Ghz WiFi was the only choice, it made sense because that was the only way for many people to get ‘net access. And 2Ghz didn’t change that much for a long time, and most boaters didn’t care when it did as they were utilizing things from much further away, thereby only needing the original technology. The other main reason many of these more pricey solutions still exist, and should still exist, is because of their custom firmware/software and support. Not everyone wants to be knee deep in the guts of MikroTik or Ubiquiti when their kids are screaming at them that their Netflix show isn’t working. In fact, I would argue that most of my time spent on the boat is supposed to be less stressful! However I believe the days of $500+ WiFi repeater systems are numbered – in the past few years, I haven’t seen adoption of 5Ghz by those solutions (one of the main topics/frustrations in comments here) and their support is less than what you would expect when issues arise. I would really like to see a couple of companies provide $300-400 solutions using the same or similar hardware in a dual band device. I think boaters would buy a new one more frequently at those prices, and be taking advantage of new technology as a result. I personally will continue buying sub $100 devices, configuring them myself, and replacing them every year or two – so I’ll be spending the same (possibly more because of my efforts to keep them running) as folks buying commercial products, but have more fun (!?) and flexibility. I completely agree. Don’t overthink if it’s made of stainless steel or submersible etc as the tech is evolving so rapidly that it will likely be obsolete in 1 or 2 years anyhow. Hence the payback isn’t there for a $600+ device. Honestly I’ve read so much iffy feedback on most of these customized firmware devices that also scares you from taking a chance on one or another. I’m certain some of these won’t be around in a year or two while others may flourish and continue support/product development. I’ve tested / bought / used almost all of the customized firmware devices. Their firmware is an improvement in terms of usability in all cases. However, they also hide certain settings it would be nice to be able to tweak, which is frustrating. I’ve considered many times product-izing a WiFi+LTE solution with MikroTik, but the support of that device would be significant and has always scared me away. While I did not have any great experiences with their support organizations, I have pretty high standards, and I also spend the majority of my working time at a networking company and understand the challenges of support. I am still considering a product offering, but it would be a DIY sort of situation, where you could get the plans, configuration details, and hardware all in one kit, with the hardware not being marked up hardly at all, and most of the cost focused on the configuration and plans. Or you can do it without it by just buying the same bits and figuring it out yourself. I do not have a link to the PDF as it is not online, but I have it and can send it in email if you drop me a note with your details. I also moved the MikroTik guide up my priority list and will spend some time on it this July 4th weekend. Anyone have experience with Mofi Network?